Eva Myrle Carlisle O’Dell Jefferies, loving mother, grandmother, sister and friend passed away on Sept. 15, 2009, in Oregon City, Ore.
Myrle was born March 24, 1924, in Millcreek, Utah, to Milton and Eva Jane Silcox Carlisle. She grew up in Salt Lake City, where she graduated from Granite High School. She married Jack H. O’Dell on Nov. 20, 1942, in the Salt Lake Temple. Their marriage dissolved after 43 years. 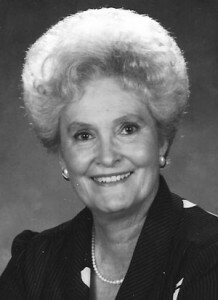 She is survived of four children, Garry (Lolly) O’Dell, Desert Hot Springs, Calif.; Dianne (Robert) Werber, Cedar City, Utah; Becky (Douglas) Gillespie, Highlands Ranch, Colo.; and Annette (Michael) Larsen, Oregon, City, Ore.; 10 grandchildren and 27 greatgrandchildren; two brothers, Milton Eugene Carlisle, Logan, Utah, and Norman H. Carlisle, St. George, Utah; and several nieces and nephews. Later in life she married William Martin Jefferies, Sept. 16, 1999, in West Jordan Temple. Martin preceded her in death on Nov. 7, 2005. She had a genuine and enduring testimony of the Savior and was an active member of the LDS Church where she served diligently throughout her life. Funeral services will be held Wednesday, Sept. 23, at 1 p.m. at Jenkins Soffe Mortuary, 4760 S. State Street, Murray, Utah, where friends and family may pay their respects from 11 a.m. to 12:45 p.m. Interment: Riverton City Cemetery, Riverton, Utah. Online condolences may be shared at www.jenkins-soffe. com.